The Mortmain family live in the crumbling ruins of an English castle in the 1930s, where seventeen-year-old Cassandra chronicles their lives in her journal. When the heir of the Mortmains' landlord settles nearby with his brother, the family hopes he may lift them out of poverty through marriage. But don't think this is a rip-off of Pride and Prejudice - the similarities end there. Cassandra's father once wrote a critically-acclaimed novel, but since then hasn't written a thing or earned any sort of income to support his wife and three children. He's an absent-minded genius, doddering about the property working on crossword puzzles and having eccentric conversations that his family can't make any sense of. To get by, they make do as best they can, selling off furniture and valuables, but now there is little left to sell. Cassandra's step-mother, Topaz, is a rather Bohemian former artist's model who is barely older than her step-daughters. But the young women all get along really well, which is a nice departure from the wicked-stepmother stereotype. The family is rounded out by two boys, a younger brother and a servant named Stephen who has become part of the family and is in love with Cassandra. Stephen's is not the only unrequited love in this novel; in fact, many of the relationships are one-sided, or at least lop-sided. Everyone seems to be in love with the wrong person and it gets pretty messy at times. Interestingly, at my book group discussion about Tibetan Peach Pie someone pointed out the part where Robbins expressed that even if the person you love doesn't love you back, you are still better for having felt that way yourself. This idea also comes up here in this very different book. (I'm honestly not sure I agree with the sentiment, but I think that's my own shortcoming.) This willingness to feel good about love for the sake of love is just one of many things that make this story a feel-good one despite some seemingly-bleak plot points. 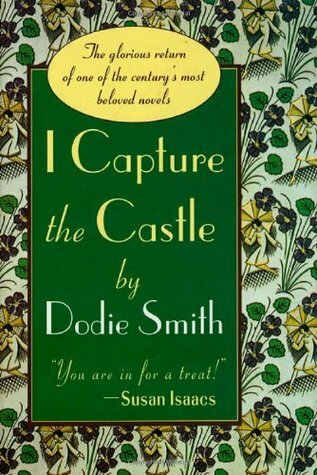 Any book that takes place in a drafty old castle in the English countryside is going to appeal to me, but this one is just so well-executed it's practically perfect. I know that poverty isn't romantic, but there's just something incredibly cozy and almost magical about Cassandra's life. I think it's just the lens through which she sees it and the way she tells us about it. I first read this book probably 13 or 14 years ago now, and I barely remembered anything about it except that it was about a teenager living in a castle and that I really liked it. This is the problem with getting older - I've forgotten books that I've read even as an adult and now I want to reread them. But there's great pleasure in starting a book that you know you'll love but that can still surprise you. I could see myself reading this again in another decade or so. I've heard this book mentioned many times over the years as a definite "good read", but never had a reason to pick up myself. Now my interest in piqued and I'll add to my list right away. Sounds perfect to round out my reading in August! Definitely do! You won't regret it.